Talk about being disingenuous and hypercritical: ShopHQ posted a note about former host Mike Davidson, who suddenly passed away. Remember, these are the same folks that abruptly let him go! ShopHQ is saddened to hear of the passing of former host, Mike Davidson. 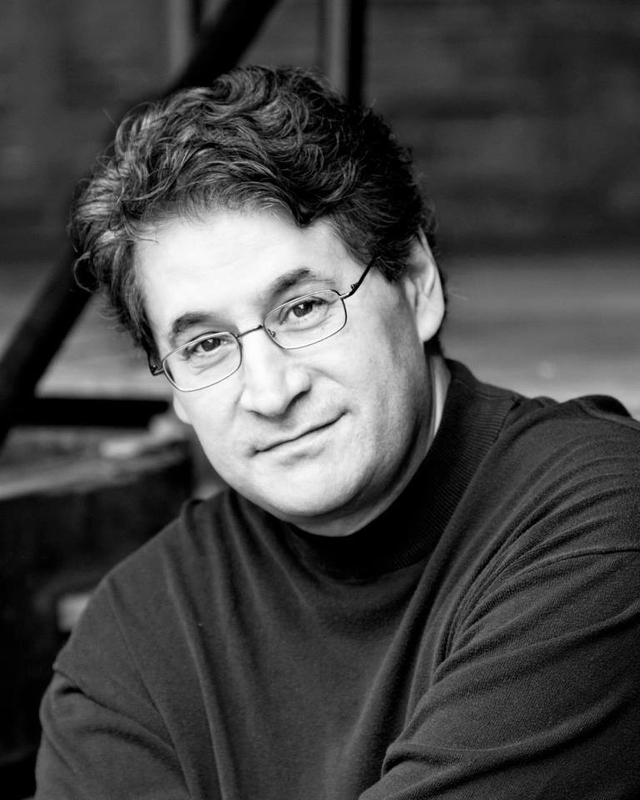 He was a member of the ShopHQ family for 13 years, and shared his life with so many of you. Our thoughts and prayers are with his family and friends. He will be missed. We’ve got some sad news folks: Former ShopNBC host Mike Davidson has passed away. We got the news via Facebook, as Davidson’s former colleagues at what is now ShopHQ and his friends posted the word. My very dear friend Mike Davidson passed away yesterday. Many of you may remember him from Valuevision and ShopNBC. His partner and love of 12 years Caron was with him and we spoke very early this morning. She asked that I let everyone know and although FB doesn’t seem nearly appropriate, he deserves to be remembered and thought of today. Mike was a constant friend and at the most difficult of times he always called and said ‘You know I love you like a sister.’ My heart breaks for all of us close to him and especially Caron, his sweet daughter Kira, his Mom and sisters. I can’t believe I won’t talk to you again..I miss you. A memorial will be held with arrangements to be posted soon. — with Mike Davidson Voice-overs. Former ShopNBC host Shawn Wilse also posted about Davidson’s death. We always thought that Davidson was a classy guy, and he was so young to have passed. According to Facebook, he was doing voiceovers as a job. Davidson’s widow posted this nine hours ago. To all people who know Big Mike Davidson, my love, life, best friend for the past 12 yrs. My name is Caron, i dont use facebook, using Mikes phone. Its with total shock and grief to tell you all that late this afternoon Mike passed away suddenly, possibly from something related to his heart, still waiting to know. So sorry to post this. When services are arranged, i will post again to let everyone know. Those sly pusses at Jewelry Television have something new up their sleeves: a “Jewelry Love” style quiz. In a press release Wednesday, JTV said that “the interactive quiz is a brand new approach in response to consumer trends towards more personalized shopping experiences.” Okey-dokey. The quiz is now online now at jtv.com/stylequiz. The answers to a “few quick questions instantly reveal a signature jewelry style personality, with hand-selected pieces to match,” according to JTV. We came out Upscale Urban, by the way. Other categories include Boho Chic, Brilliant Bombshell and Class Act. “We strive to stay in tune with our shoppers and consumer trends,” JTV Vice President of Marketing Jill Johnson said in a canned statement. JTV’s Jewelry Fest, June 2 to 8, offers will offer an opportunity for homeshoppingistad to put their ‘Jewelry Love’ style quiz results into action. “JTV will feature a comprehensive array of colors, textures and cuts – all in one dynamic week – so that fans can discover additional pieces that reflect their signature jewelry style personality,” the network said. JTV also announced its Jewelry Fest Escape Sweepstakes. You can enter June 2 to July 31 at jtv.com/escape for a chance to win a trip for two and a $1,000 JTV jewelry wardrobe. The total prize package is valued up to $7,600. The winner will choose from one of four luxurious destinations including Napa, Paris, Las Vegas and Costa Rica. Yesterday the New York Daily News did a two-page spread called “Getting Into Character” in its style section. It was a pictorial of clothes, jewelry and other accessories inspired by movie, cartoon and comic book characters. HSN got a shout-out because the layout had a photo of a Heidi Daus “Maleficent Dragon” necklace based on the movie, which comes out this week and stars Angelina Jolie. We looked up the necklace on HSN.com, and its price is now $330. Its official name is “Alluring Interlude.” Daus, of course, is fellow resident of Montclair, N.J.
Take a break from reality. This fantastical drop necklace looks like it came right out of a fairytale. Reminiscent of the costumes from Disney’s Maleficent, this crystal-covered design is wickedly glamorous. This may not be good news for ShopHQ’s dissident shareholders: The No. 3 home shopping network had a pretty good first quarter. ShopHQ’s net sales in the first quarter rose 6 percent to $160 million, boosted by strong customer demand in fashion, accessories and beauty, health & fitness. That compares to the 1 percent increase that QVC saw, to $1.3 billion, and the 1 percent dip that HSN experienced, to $544.5 million. Gross profit dollars increased 5 percent to $60 million in the quarter, while gross profit as a percent of sales remained strong at 37.6 percent, compared to 37.7 percent in the year-ago period. ShopHQ’s adjusted EBITDA was $6 million, flat compared to a year ago, as the company’s sales and gross profit improvements were offset by investments in channel positioning within TV distribution costs. In addition, net shipped unit volume increased 28 percent over the same quarter last year, resulting in higher variable costs to support this growth. ShopHQ’s first-quarter adjusted net income was $2 million, or three cents a share. That compares to the year-ago period’s adjusted net income of $1 million, or two cents a share. In its press release, the network said that its strategic focus on building its ShopHQ customer base yielded solid gains, as total customers purchasing over the last 12 months rose 22 percent to a record 1.4 million. Customer growth was driven by the company’s ongoing focus of broadening its merchandise offerings as well as strategically lowering its average price point, which decreased to $76 in the quarter compared to $93 in the same quarter last year, according to the release. These changes support continued customer growth and increased purchase frequency, which rose 9 percent in the quarter over the same period last year, the statement said. “We are pleased with our Q1 results, which marked the 8th consecutive quarter of sales growth and positive adjusted EBITDA,” ShopHQ CEO Keith Stewart said in a canned statement. Stewart’s lieutenant also had a few words. “Our balance sheet condition remains strong,” EVP & CFO William McGrath said. 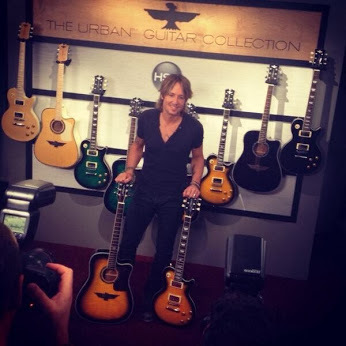 Beating his own record, no pun intended, Grammy winner and “American Idol” judge Keith Urban returned to HSN Sunday to sell more than 22,000 guitars, the home shopping network said Wednesday. The too-cute country music star, who is married to actress Nicole Kidman, bested his previous record of 20,000 guitars. That mark was set during his sellout debut on HSN last November. You gotta love Urban and Kidman. We recently read an interview with Kidman, and she said she often travels on the road with Urban. One of their favorite fast-food spots is Wendy’s. Can you imagine walking into a Wendy’s and seeing those two! Most recently on HSN, Urban was hawking his limited edition “Light The Fuse” and “Phoenix” Urban guitar packages. Urban introduced his “Light The Fuse” guitar series on Sunday as part of his Urban line of guitars. Oy! Joy Mangano, president of HSN affiliate Ingenious Designs, chimed in. The “Light The Fuse” limited edition series was inspired by Urban’s chart-topping album “FUSE” and “Light The Fuse” tour, which kicked off last year. The “Light The Fuse” Collection features two versions of the “Light The Fuse” guitar — all wood electric or acoustic-electric — and comes in five gorgeous flame maple burst color ways – Brazilian, Ebony, Brazilian Blonde, Cherry Red and Teal Burst. It is part of a 21-piece set that includes a powerful 15 watt amplifier; extra set of comfort coated strings; carrying case; signature guitar picks; and a double-lesson DVD. It’s nice to hear that HSN is doing good. HSNi Cares, the philanthropic arm of HSN’s parent company, on June 1 will launch a national campaign to support of Habitat for Humanity International. The network, by the way, is breaking ground on its fourth Habitat for Humanity of Pinellas County home this month. HSN, Ballard Designs, TravelSmith and Improvements “will promote Habitat’s vision of a world where everyone has a decent place to live,” according to a press release Wednesday. Customers of these brands will be able to make a donation in support of the campaign when buying online or by phone from June 1 to 30. “At HSNi, we strive to create a culture of generosity, where creative people who are passionate about what they do have a way to give back, not only to our local community, but to causes that impact women and families everywhere,” our buddy Bill Brand, chief marketing and business development officer for HSN Inc., said in a canned statement. “We are excited to build on the strong partnership we forged with Habitat by introducing our first national campaign in support of the tremendous work the organization does with families worldwide,” he said. As part of the campaign, on June 6, HSNi Cares and Improvements Cares will team up and make a donation of $3 an item for select Improvements products sold on HSN. When customers purchase these items on their HSN credit card, the donation will be doubled to $6. Additionally, Ballard Designs and TravelSmith will work to raise awareness for Habitat among their customers and raise funds for the organization. HSN employees each receive two days of paid time off for community service annually. Since 2010, employees have volunteered more than 2,000 hours to help build four houses for Habitat for Humanity. It looks like other QVC shoppers that picked up the recent Kate Somerville Today’s Special Value were as disappointed — and pissed off — as us. The damned dispenser doesn’t work! Talk about one big dud! Somerville, skin expert for the Hollywood stars, recently offered a “dual-phase” serum at the TSV. It included Vitamin C “matrix” and an omega skin serum in side-by-side chambers, each with it own pump to dispense the stuff. The idea was to pump both dispensers at the same time to get equal amounts of both treatments to put on your skin every night. We ordered it on auto-delivery, and we were excited to get it. The first time we tried to use it, only the Vitamin C lotion came out, not the skin serum. We thought maybe we just weren’t pushing that other pump hard enough. So we tried it the next night, and again, nothing came out of the skin serum dispenser. The next day we called QVC customer service and said the item was defective and we needed to return it. The rep asked if we wanted a refund or a replacement, and we opted for the replacement. We hope that wasn’t a mistake, because we later checked the customer reviews on the Somerville product and it seems we we’re the only ones with a shoddy dispenser. Where the hell was quality control with this item? Do you see a theme here? We hope our replacement works. Another refugee from a Bravo “Real Housewives” show has launched a clothing line on a home shopping network. We missed it this afternoon, but Countess LuAnn de Lesseps of “Real Housewives of New York City” debuted her line on ShopHQ. It was her birthday, by the way. The “Countess Collection” from the reality TV star featured dresses, pants and jackets, all supposedly under $70. NeNe Leakes of “Real Housewives of Atlanta” will be bowing her fashion collection soon on HSN. ShopHQ’s dissident shareholders, hell-bent on ousting the home shopping network’s CEO Keith Stewart, have taken a very unusual step. They have launched a website featuring a video of their nominees for ShopHQ’s board. The Clinton Group has nominated six people — including several TV veterans — to be ShopHQ’s directors and is soliciting votes for them at the company’s June 18 meeting. The video and Clinton Group’s other proxy materials are available at http://addvalueandvision.com. Take a gander. The Clinton Group nominees for ShopHQ’s board include former HSN CEO Mark Bozek, who does most of the talking during the video. Board nominee Tommy Mottola, described as “the iconic former Chairman and CEO of Sony Music Entertainment,” also eloquently talks and appears in the video. He is the ex-husband of diva Mariah Carey. The nominees Ron Frasch, the former President and Chief Merchandising Officer of Saks Fifth Avenue; Bob Rosenblatt, the former President of HSN and Tommy Hilfiger and CFO of Bloomingdale’s; and Fred Siegel, the former SVP of marketing at QVC, are also in the video picture. Along with the definitive proxy statement, The Clinton Group will soon be mailing this cover letter to ShopHQ shareholders. We are investors alongside you in ValueVision Media Inc. (“ValueVision” or the “Company”). We believe the Company has a terrific collection of assets that can be operated in a way that creates significant shareholder value. We are seeking to replace a majority of the current directors of the Company to foster a new vision and strategy for ValueVision that we believe can help us all by generating sustained profits and share price appreciation. We believe the Company and Board of Directors are not doing enough with the Company’s assets and that the current Board suffers from a lack of ambition. Reading the Board’s recent letters and proxy statement, we cannot help but conclude that the current directors are very content with the Company’s market position and financial performance. The Board touts, for example, that the Company is now losing less money each quarter than it once did. Color us unimpressed. The current Board has declared victory while the Company languishes as a declining, third-place market share player in a three-company market. In our view, five years into the tenure of the Chief Executive Officer, Keith Stewart, the Board should only be satisfied by consistent profitability and sustained value creation for shareholders. Instead, doing slightly less bad is seemingly enough. Not for us. We are disappointed by the performance of the Company and its leadership team. ValueVision stock trades today at approximately one-third the average price for which it traded during the ten years prior to Mr. Stewart’s tenure. The Company is valued by the stock market at a mere tenth of HSN and a thirtieth of QVC. And, while ValueVision stock has moved sideways since January 2010, HSN and QVC have generated significant value for their stockholders, including substantial and growing profits. The current Board seems to focus exclusively on the stock performance during the first eleven months of Mr. Stewart’s tenure, from the financial crisis low in January 2009 to a rebound in December 2009. While it is true that ValueVision’s stock price bounced off its bottom of mere pennies per share during the period of the financial crisis, so too did the stocks of scores of other companies. Since then, however, ValueVision’s stock price has been essentially flat. For how long will the Board allow Mr. Stewart to produce no returns for stockholders just because the stock recovered from its financial-crisis bottom in the back half of 2009? With respect to the fundamental financial performance of the Company, the Board appears satisfied with declining losses, though we know that shareholders cannot survive on losses, no matter how small. And how disappointed must Mr. Stewart be? After all, Mr. Stewart himself declared confidently that he could grow the business into a $1.1 billion revenue generator, producing more than $12 of sales per year on average in each home in which the Company’s programming was available. Mr. Stewart repeatedly stated this goal in 2009, 2010 and 2011. And, frankly, by many measures this was a rather modest goal: HSN generates $24 of sales per year per home, and QVC substantially more. Even ValueVision itself generated more than $10 of sales per home in every fiscal year from 1999 to 2007. But, alas, Mr. Stewart did not achieve his financial performance goals. Or come close. Last year, the Company generated just $640 million in revenue, or $7 in sales per home, 40% below his own target. Moreover, fully five years after Mr. Stewart was put in charge, and despite his repeated predictions of operating cash flow margins in double digits, the Company continues to lose money. While HSN and QVC have increased revenue, sales per home, gross profit and EBITDA in the United States compared with their pre-recession levels, ValueVision is a diminished version of its former self; on all these critical metrics, ValueVision is performing worse than it did in 2006. It is no wonder, then, that the stock has not recovered to its 2006 year-end level of $13. Or even half that. Yet, the Board says it is satisfied and that we (and you) should be too. Well, we are not. We are, more precisely, gravely disappointed by the Company’s record of losing money in 20 out of the last 21 quarters. We do not equate losing less money with success and we are concerned about a stock price that has not recovered to even half of its pre-recession level. We are worried about the lack of a plan to reverse these trends or, seemingly, even a recognition of the need for change. And, we are disappointed in the Chief Executive, who has missed his own stated goals by a wide mark and has been lapped by the industry leaders, who continue to grow their share through innovation. (We note that Mr. Stewart missed the Company’s target performance by such a wide mark in three of his five years as CEO that he failed to earn any annual incentive bonus in those years.) If Mr. Stewart and the Board have a vision for break-out performance and distinguishing the Company from its recent history or its competitors, we have not heard it. We think losing money every quarter while the stock price moves sideways calls for a hands-on, energetic management team with a detailed turnaround plan. Instead, the Company’s Board permits no fewer than nine of the senior officers (including the President, the Chief Operating Officer, the Chief Financial Officer and the Chief Merchandising Officer) to literally “phone it in” one or two days per week while they “work” from their homes, many more than 1000 miles from the Company’s headquarters. Since when do million-dollar-per-year executives only have to show up for work a few days a week? Is it possible that the Company has not achieved Mr. Stewart’s own goals or stemmed the loss of market share because the executive team is not in Minneapolis, working with their direct reports, vendors, on-air talent and the finance team consistently, Monday through Friday? We fear this lackadaisical approach to corporate management is, sadly, just part of the problem. The bigger issue is that the Board and executive team do not have a strategy to break the pattern of under-performance. We do. We believe this situation calls for new directors with deep industry experience and judgment. The Clinton Group has therefore nominated six independent professionals to serve on the Board of ValueVision. None of these nominees is an employee of the Clinton Group, nor does any have any other tie to our firm. They each do have notable and relevant backgrounds and together can form the backbone of a fresh new Board, implementing what we believe is a plan for success. We trust that these nominees will serve the interests of all shareholders. You are currently browsing the Homeshoppingista's Blog By Linda Moss blog archives for May, 2014.